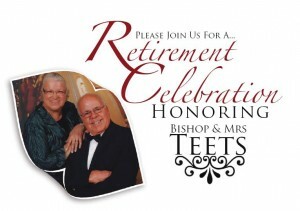 Home / Bishop & Sis Teets Retirement Celebration! Bishop & Sis Teets Retirement Celebration! The New Life Apostolic Church family would like to extend a warm invitation to you and your congregation to the Retirement Celebration for Bishop and Mrs. F. Scott Teets. This celebration is designed to recognize and honor their ministry and contributions to our church family, the NY Metro district as well as their impact on the people of God in a variety of locations. Bishop Teets along with Sis Teets has served in the capacity of Evangelist, Missionary, Pastor and various NY Metro District offices including Superintendent. The Teets will be relocating from the NY area this fall and we would like to take this opportunity to thank them for their years of service. This event will take place on Saturday, October 20, 2012 at Leonard’s of Great Neck, 555 Northern Blvd, Great Neck, NY 11021 from 1:00pm to 5:00pm. Donation per person is $80. Of note, October 20th is also the Teets 50th wedding anniversary. Please provide us with a contact person from your church by Sept 10th that we can work with to coordinate the number of attendees and manage ticket monies. We would like to have a total count by September 30th and all funds collected by October 8th. We look forward to hearing from you and are excited about celebrating this event with you and your church family. If you need any further assistance please feel free to contact us at (347) 809-7236.